This is so super adorable Sherrie! What a cute gift bag!!!! Thanks for joining us at the 3 Girl JAM Challenge! I love bit o honey! and bees. And the bee in blue is heavenly!! So so cute!!! Such a darling treat! Oh Sherrie this is sooooooo cute!!!!! I love that adorable bee and those candies were once my favs!! Hope you are having a great day! 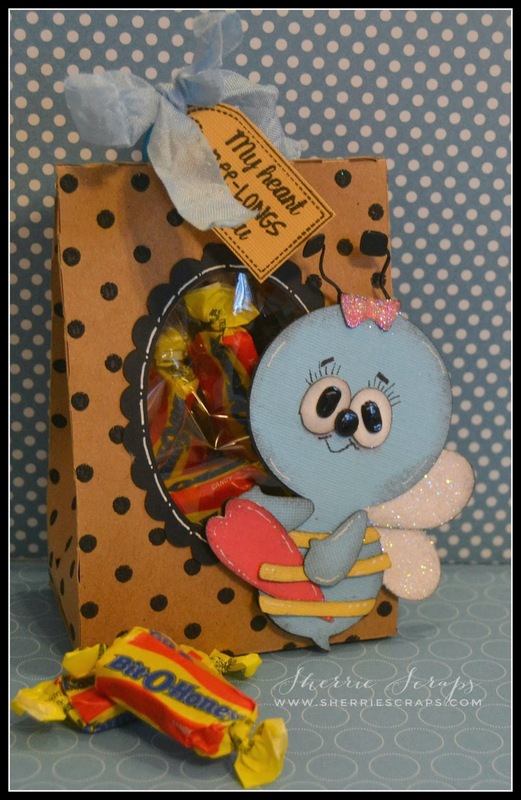 An adorable bee with his bit o' honey treats....what a sweet bag! 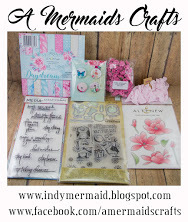 Thanks for sharing with us this week at Loves Rubberstamps, good luck. Sherrie ~ So stinking CUUUTE!! LOVE that bee and LOVE how you didn't make it the typical colors too! Those eyes and your doodling is seriously FABULOUS!! Well I just have to say ~ warmer weather has finally arrived here! My son is running around in shorts! Ha ~ Have a great day! 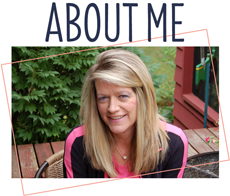 Oh my gosh, Sherrie, this is absolutely adorable!! That bee is so darn cute!! I love her eyelashes and sparkly wings!! What a fabulous treat this is!! It makes me smile!! I don't know what I love more ... the bee or the bit-o-honey (my FAVE candy!!!) ... this is FABULOUS! LOVE IT!!!!!!!!!!!!!!!!!!! Oh this is sweet!! I love the little bag and bee and I love bit o honey! So this is an all around perfect little gift!! Oh my gosh - this is so sweet! What a cute little bee and the gift bag is just darling. I love the fun sentiment, just perfect for this bag of goodies! So super cute Sherrie. Love those eyes! Awesome gift bag!! 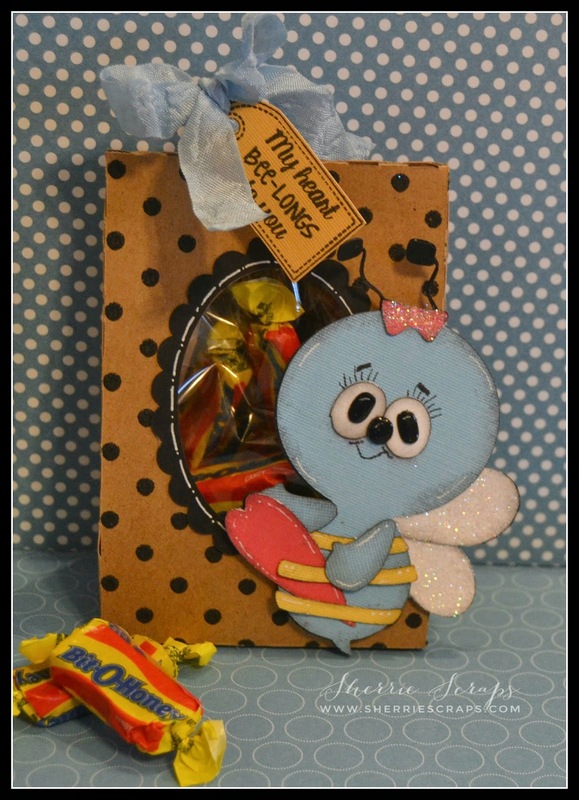 Super fun treat bag! That bee is just adorable, I used it on one of my projects too! The touches of sparkle look awesome! Your treat bag is adorable Sherrie , I just love those bits of honey. The bee is the perfect touch. What a super cute treat bag!! 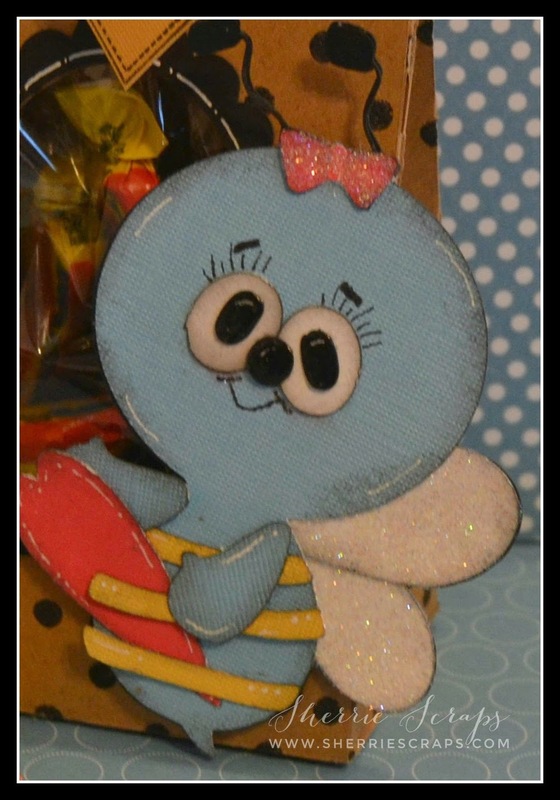 Love the adorable bee!! Have a great day. oh my goodness sherrie, this is so STINKIN' CUTE, and it put a big smile on my face!!! 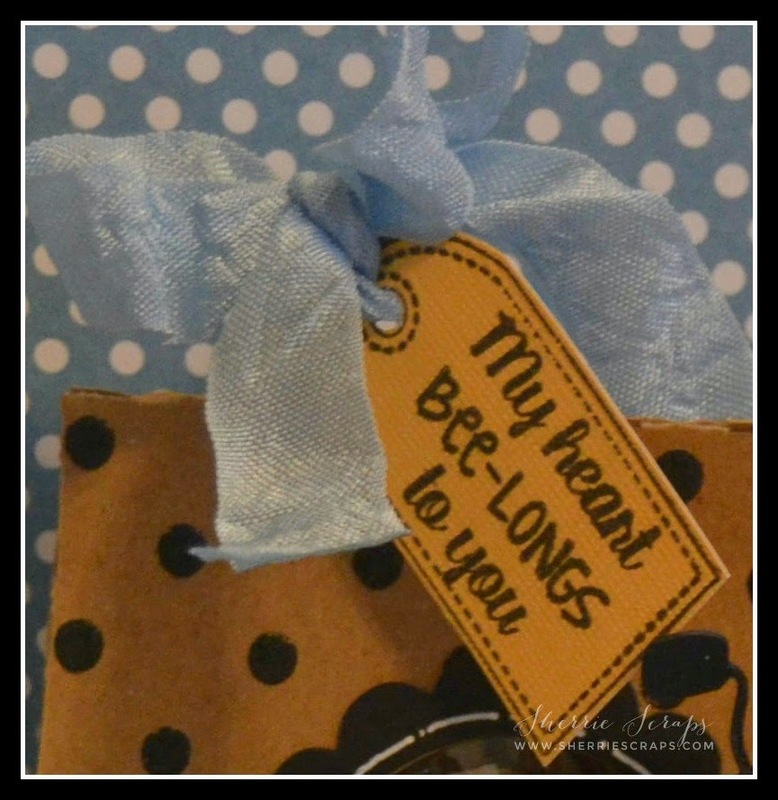 Darling treat bag- love your bee holding the heart and the shimmer on its wings too. 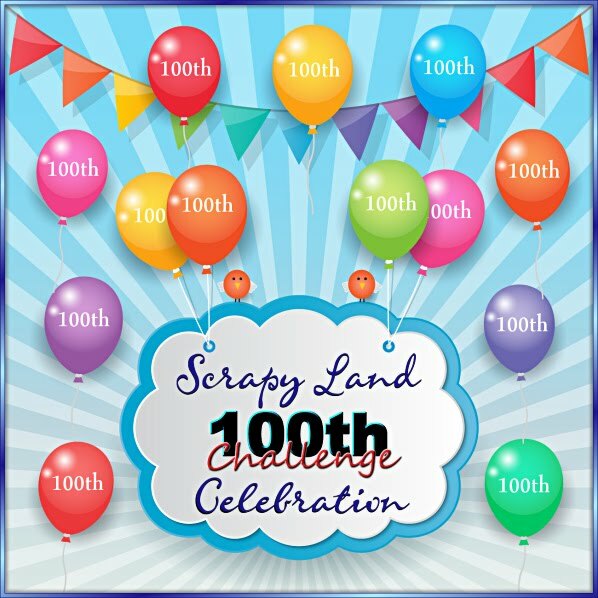 Always enjoy seeing you at Sweet Stamps- fun entry for our challenge! I just LOVE your BEE! That is the most cutest bee EVER!! I love it!! 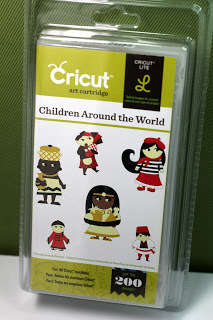 Super cute project Sherrie! That little guy is so adorable! The eyes are so endearing! Oh now look at this! What a super cutie, that sparkle is awesome! Those eyes are just so sweet! Buzzing by to say I love your big treat bag. I love the sparkle on the wings and the bee is adorable. Oh My goodness this is way to cute and I love the window:) Thank you for joining us over at Decorate to Celebrate! This is so cute! I love it!!! Thanks for joining us at 3 Girl JAM! This is so ridiculously CUTE!! That bee is simply adorable! I love the sweet eyes! I've never heard of Bit-o-Honey sweets before - but how perfect are they for your darling little treat box? !